Sponges are some 5 or 10,000 members of the phylum Porifera, meaning "pore bearer". 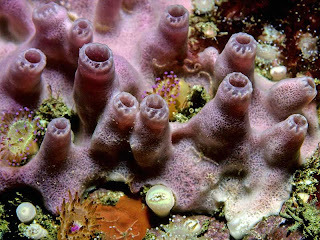 They really are full of holes, which I guess is why they're called Sponges, too. But we'll get to that! 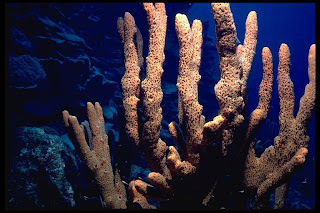 People often think of Sponges as plants, or else as some weird thing that doesn't really fit anywhere. The latter is closer to the truth, since Sponges are ancient members of the Animal Kingdom, an early experiment that succeeded magnificently. Really, they're probably better thought of as mindless towers of flesh. Or perhaps they're not so mindless? 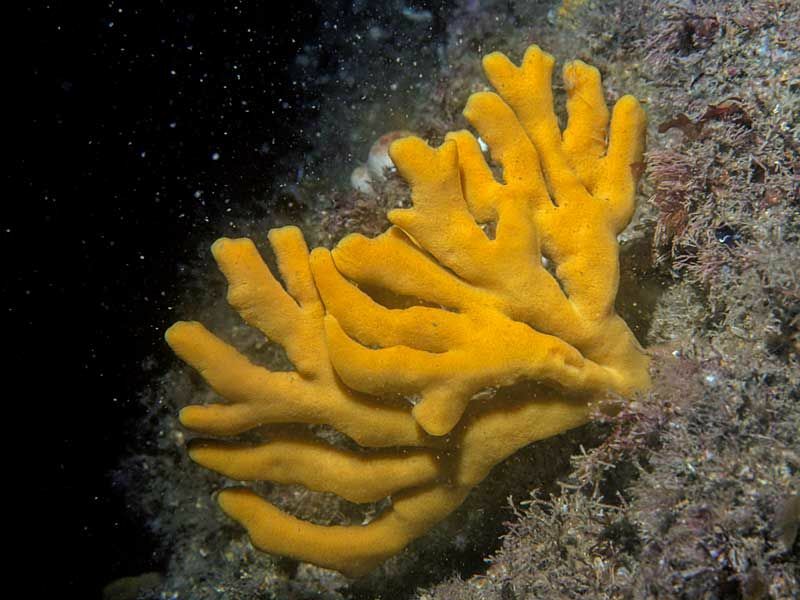 Sponges show us a whole other way of being a multi-cellular animal. They have no nervous system, no circulatory system and no digestive system. No brain, no heart and no stomach. No mind, no blood and no guts. No dreams, no passion and no courage. Oh dear, it's not looking good. And yet these creatures are found in fresh and marine waters, from pole to pole and from right up at the surface all the way down to miles beneath the waves. Give them some ground to live on and water to live in and they'll sort out the rest. They must be doing something right! Or at least something interesting. One of these interesting things is to do with all those cells. You see, while they have no organs, Sponges still have specialised cells. But they are the only animals who have specialised cells that can change themselves into completely different specialised cells. They can go from having one function to another, completely different function. If you squeeze a Sponge through a fine cloth or sieve, the tiny bits of flesh and individual cells can slowly clump together to form whole new Sponges! And yet I almost cry when I hit my toe on a door... I'd be beside myself if I got squished through a sieve. Beside myself! Anyway, these specialised cells move about in the mesohyl, which is non-living, gelatinous stuff. Like jellyfish and other cnidarians. Sponges have 2 layers of cells with non-living, gelatinous stuff in between. A jelly-cell sandwich, yum! No, wait... yuck! 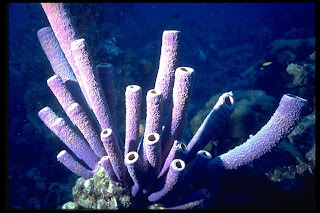 Many Sponges are a simple tube shape. The outer layer of cells serve as skin, while the inner layer has lots of flagella that wave around to create a water current. This water current is so important, that Sponges are completely built around it. Literally, in a way. One consequence of this is that Sponges, unlike jellyfish, actually have an internal skeleton. It's in the mesohyl and it's made of spicules, which are little rod or star shaped minerals, or collagen fibres. This allows the Sponge to maintain an actual shape. But what shape will they choose? Well, ambient currents around a Sponge are slightly faster closer to the top than they are at the bottom. This provides suction to create a current that goes through the animal with no effort at all. Sponges want to get a shape that creates as strong a current as possible, so that the flagella inside needn't work as hard. They tweak their shape over the years to get it just right. So a Sponge is pretty much a chimney. Water gets in through pores all along the sides, carrying oxygen and bacteria to eat with it. It then flows out through the top via what's called the osculum, carrying waste products out. It's a little bit like a living length of stray intestine. Except with more holes. 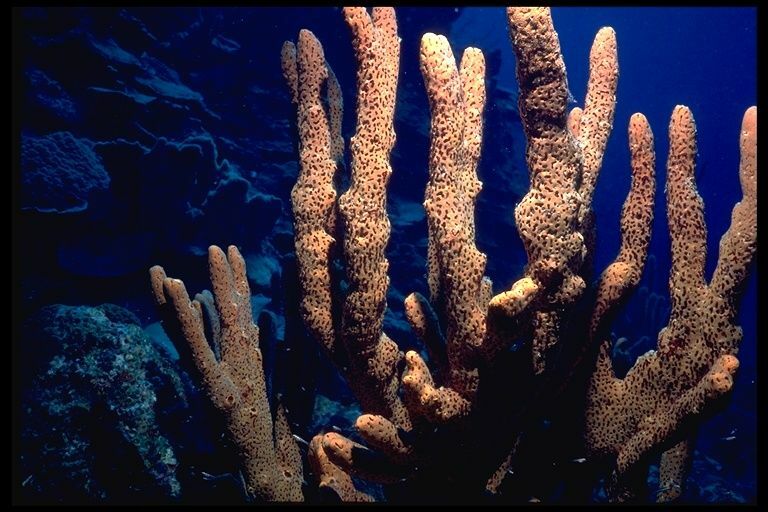 In reality the Sponges that are simply a tube are all extremely tiny. Big ones that can reach over 1 metre (3 feet) in diameter have networks of passages for water to go through before they reach the big chimney. This gives them a lot more surface area to push water along and get food out. It's clear these pores are extremely important. Wouldn't it be terrible if they got all clogged up? Of course it would! That's why Sponges can close those pores if there's too much sand and silt about. They can also partially or totally close the osculum at the top and vary or completely stop the beating of their flagella. They even have cells in their mesohyl that can unblock the pores if needed. It looks like they're doing nothing at all, but Sponges simply make it look easy! There are other cells in the mesohyl for feeding, reproduction, immune responses and other labours. As I say, these cells can change from one to the other when required. 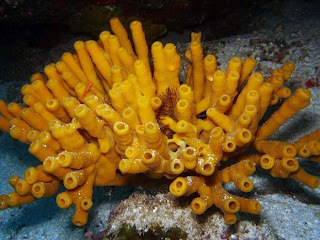 This is great in general, but it also allows Sponges to use some incredible reproduction techniques. For one, a new sponge can of course grow from a fragment of an older one. A few can also go through budding, where a new one grows from its parent and detaches when ready. The best one uses things called gammules, and is much more common in freshwater than marine species. A gammule is a little escape pod produced by the adult. 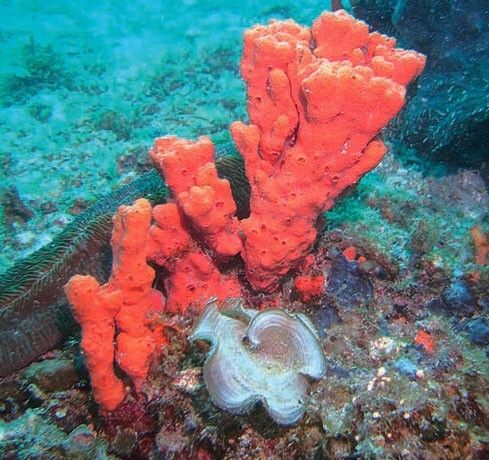 Dying Sponges can release thousands of these, especially if the weather is starting to get cold. Each gammule is covered in the tough collagen proteins that are used for the skeleton and inside are lots of cells that can change into the other cells. They are also full of nutrients, so that this thing acts like a seed that can survive cold, drying out, lack of oxygen and extreme salt levels. A young Sponge bursts forth when the weather is right, having braved inclement weather in the best way possible: utter dormancy. As it grows, it might even fuse together with other, nearby youngsters to form a single adult. Now that's family values! I think. Most Sponges use sexual reproduction, though. They're all hermaphrodite, and release sperm via the osculum. Other individuals capture these sperm cells in just the same way they take in bacteria but instead of eating them, they're sent to fertilise the eggs. 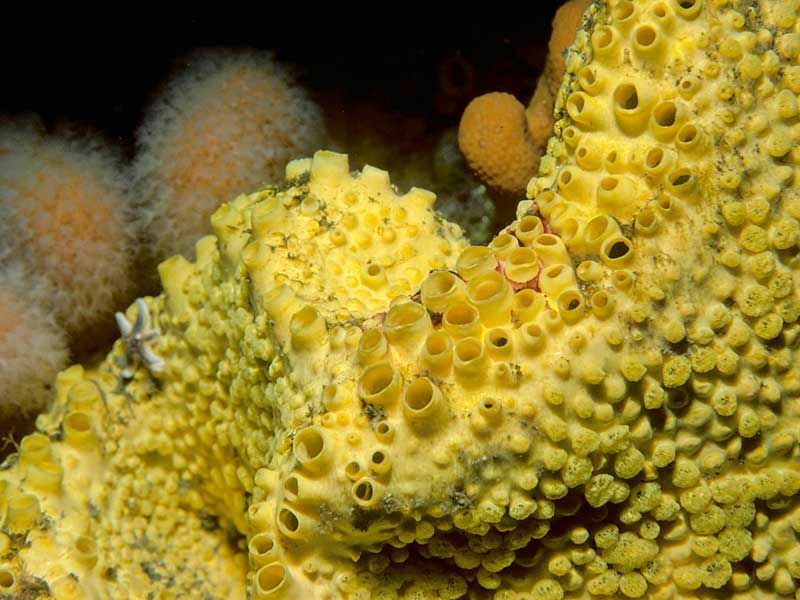 A few Sponges release these eggs without a care in the world, but most keep them until they hatch. Larval Sponges are covered in hair-like cilia to swim about for a few days. They then sink to the floor and crawl until they find a nice place to stay. They go from swimming free, to crawling along the floor and end up sitting down doing not very much. Personally, I did the lying about and getting fed a long time ago. I've done the crawling across the floor. Now I just want to swim free! no dreams, no passion, no courage. ha! They're doing well without it, though! This was a very informative and entertaining post! I think I'm almost jealous of the sponges and the blissful simplicity of their existence...though I do value my passion and courage. I'm glad you enjoyed it! And yes, the serenity of the sponge is quite appealing... until you want to try out something else for a while. But... I don't do ANY of these things. So why does my dad keep calling me a sponge? Haha! Just one of (Crunchy's) life's mysteries, I guess!